1. Heat broiler. Assemble sandwich: Spread butter on the outside of two slices of bread. On the inside of one slice, spread 1 tablespoon pizza sauce, then top with 3/4 cup mozzarella, five slices of pepperoni, Parmesan, and basil. Top with remaining slice of bread, buttered side up. 2. 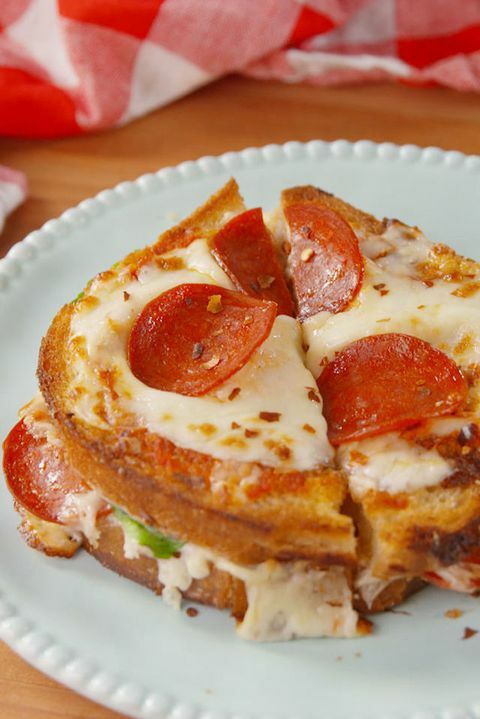 In a large, oven-safe skillet over medium heat, cook sandwich until crispy, 5 minutes per side. 3. Spread remaining 2 teaspoons pizza sauce on top of sandwich, then top with remaining 1/4 cup mozzarella and remaining three pepperoni slices. Broil until cheese is melty and golden and pepperoni is crispy, 2 minutes. 4. Garnish with red pepper flakes and serve.